Portland, Oregon is considered one of the nation’s top 10 most haunted cities by many. In the 1800s, Portland was a bustling port town, with many shipments and sailors arriving and departing each day from all around the world. Unfortunately, all of the activity associated with the ports, coupled with labyrinthine underground tunnels that run beneath the city streets, added up to something much more sinister than shipping yards of fabric and containers full of expensive spices. 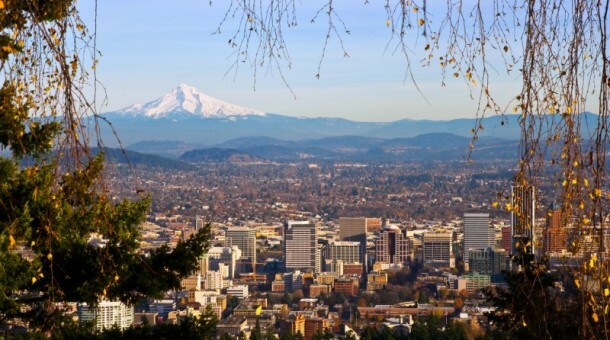 In fact, Portland became known as a city notorious for it’s human trafficking. People known as “Shanghaiiers” would often kidnap unsuspecting men, women, and children off of the streets, and smuggle them through the underground tunnels to boats, where they were shipped to the Orient and forced into prostitution and slavery. Today it is rumored that the tunnels under the city are haunted by the ghosts of those who were taken – most of whom were never seen or heard from again. Pretty spooky, right? And to think I used to live there! Just one ghost story or haunted location wouldn’t put Portland on the map as one of the top ten most haunted cities in the country, however. Especially not when – compared to the east coast – the west coast is just a youngin’ with barely anything of historical significance outside of The Oregon Trail. No, if you want to beat those east coast baddie ghosts, you have to have more than just a couple of haunted tunnels on your side. In fact, Portland has several “haunted” locations including the Bagdad Theater and Pub, The Benson Hotel, and the famous Crystal Ballroom. One such haunted location happens to be my favorite, though. As a child growing up, my mom and I often went for walks and hikes around the city. My personal favorite place to hike and explore was Pittock Mansion. Now a museum owned by the city, Pittock mansion was once the grand house of Henry and Georgiana Pittock, two extremely prominent members of Portland society in the late 1800s through the early 1900s. Henry became the owner and operator of “The Oregonian,” a newspaper many still subscribe to today, while Georgiana worked tirelessly to better the lives of women and children at the time, and founded the Portland Rose Festival which is still celebrated annually. The mansion is nestled on 46 acres, and sits 1,000 feet above downtown Portland, and the entire property encompasses perhaps the best views in the entire city and features beautiful plant and bird life. Designed by architect Edward Foulkes, it was one of the most technologically advanced houses of it’s day – and still is! It was even built by entirely local craftsmen, out of entirely local materials, making it environmentally friendly as well! Unfortunately, Henry and Georgiana didn’t live in their dream house for very long. The construction was finished in 1914 when the couple was 79 and 68 respectively. The two spent a mere four years in the house together before Georgiana passed away in 1918, with Henry following just a year later. Perhaps this is why, when the mansion opened to the public in 1965, after extensive restorations to fix damage caused by the Columbus Day storm, people began to notice strange occurrences in the house – because the Pittocks weren’t done living there yet! In fact, there has been a long history of hauntings that are attributed to people who feel as though they died too soon, and didn’t live long enough in the place they loved. Since then, many people have reported smelling the scent of roses in the house (they were Georgiana’s favorite flower) even when none are present. A childhood painting of Henry has also been known to move about the house, sometimes mere minutes after it was last seen. It is also said that the sound of footsteps in the hallways and on the grounds. Several people have even seen apparitions of the Pittocks appear throughout the house, while others have felt an unseen presence that had the air of someone proudly escorting them around. A native shaman, visiting from Hawaii once said that he “can feel the spirits of the Pittocks here, and they are very happy.” Since I was always drawn to the mansion and have many happy memories there from my childhood, I like to think that that’s the case as well! Do you have any “haunted” locations where you live? Where is it and why is it considered haunted? Are there any well-known local ghost stories? Share some of your local legends in the comments below – it’s almost Halloween, after all! To find out more about Pittock Mansion, or to visit the museum and tour the house Click Here. Top Ten Most Haunted Cities in the U.S.